Red Carnation-Loving Ohio Boy, Oh Where Can You Be? Cautious. Devoted. Dutiful. Friendly. Good-tempered. Intelligent. Kind. Methodical. Neat. Patriotic. Pious. Polite. Quiet. Self-effacing. Solicitous. Studious. With the help of author Robert W. Merry, I’ve concluded that one such example could be found in the short, broad-shouldered Ohioan who was our 25th President: William McKinley. Merry suggests that while this congenial man’s critical thinking and leadership abilities have been dismissed, his quiet ways gave him a commanding presence that made people respond to him. The flamboyant Theodore Roosevelt, who succeeded McKinley after his September 1901 assassination, may have overshadowed him, but McKinley’s accomplishments prove that he shouldn’t be overlooked. Some Ohioans didn’t think McKinley should be overlooked either. Recalling that McKinley wore his favorite flower, a carnation, in his lapel, members of the Ohio legislature named the red carnation as the state flower after McKinley’s death. Dayton native Lewis G. Reynolds founded the Carnation League of America in 1903 and instituted Red Carnation Day, an annual memorial to McKinley. Standing for patriotism, progress, prosperity and peace, the League encouraged all Americans to wear a red carnation on McKinley’s birthday: January 29. Honoring McKinley’s birthday in this way also encouraged more people to appreciate the value of flowers and to patronize florists — something to which Americans were unaccustomed. In Dayton alone that year, more than 15,000 carnations were sold on McKinley’s birthday. After the United States entered World War I, people started wearing an American flag instead of a carnation on January 29. 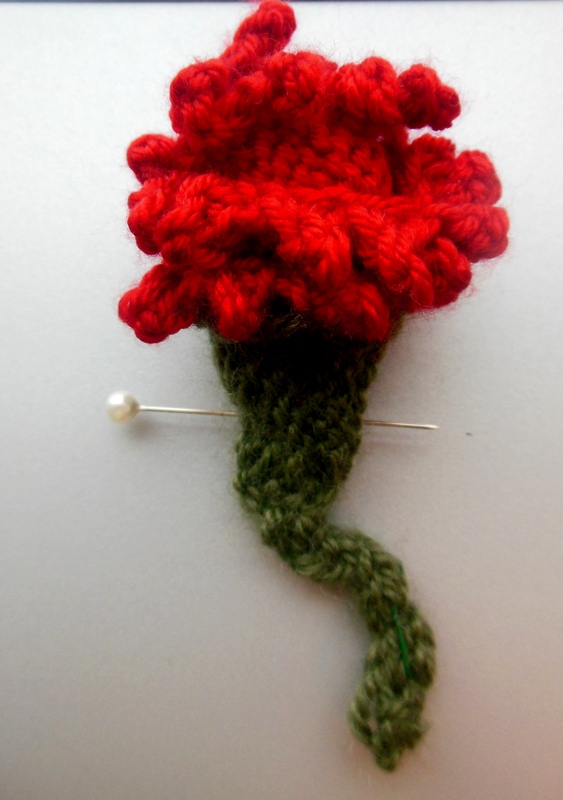 In 1918, Red Carnation Day celebrations began declining and eventually stopped. The Ohio Statehouse, ho wever, continues observing McKinley’s birthday by installing a small display on McKinley and Red Carnation Day on January 29. This year, the Statehouse Museum Shop and Graze, the Statehouse’s on-site restaurant, also offered special discounts to people who wore a red carnation or dressed in red on January 29. Sporting a red carnation that I knitted for the occasion, I stopped by the Statehouse to see the display and several other McKinley-related artifacts, both from the Statehouse’s own collection and on loan from the Ohio History Connection. 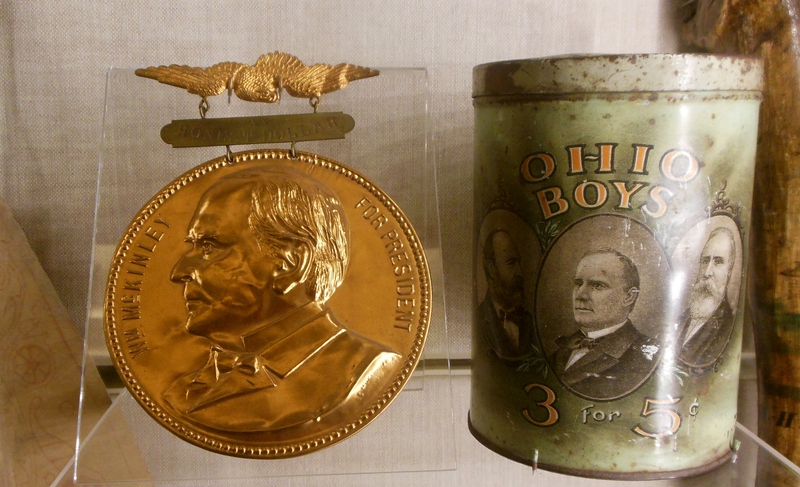 In the Museum Education Center, I spotted a medal promoting McKinley’s 1896 presidential campaign, as well as a tobacco tin celebrating the “Ohio Boys”: Presidents James Garfield, McKinley and Rutherford Hayes. 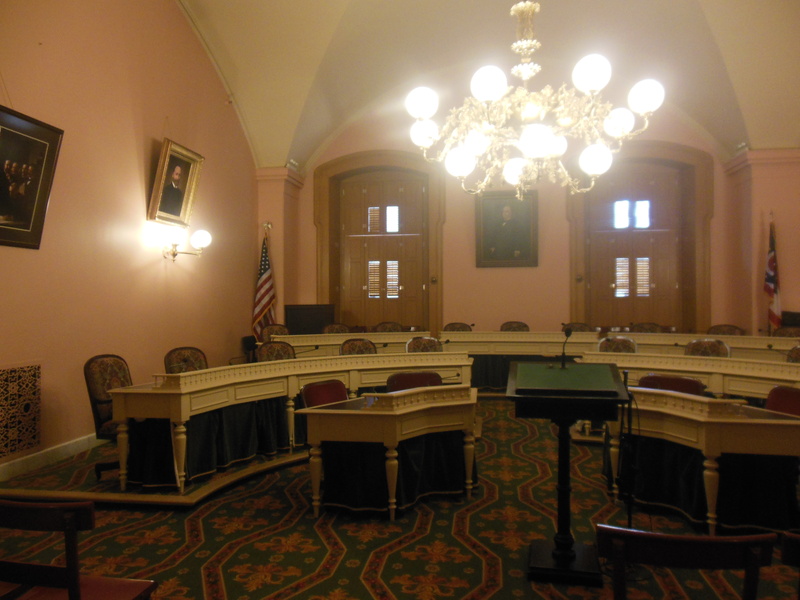 To recognize the eight Ohioans who were elected President of the United States, the Statehouse named hearing rooms in their honor. Artifacts from the lives of the men whose names they bear are on display. In the McKinley Hearing Room, I saw an “Honest Dollar” political medal from McKinley’s 1896 presidential campaign, in keeping with its “Sound Money” theme achieved by retaining a strict gold standard for American currency, and a drinking glass etched with McKinley’s portrait. Inaugural keepsakes include a patriotic silk ribbon with a celluloid button, as well as a program from McKinl ey’s 1897 inaugural ball. Reading the program’s online catalog record, I discovered that the inaugural menu included oysters prepared three ways, consommé, chicken cutlets, sweetbreads, terrapin, chicken salad, crab salad, lobster salad, tongue, Smithfield ham, game patties, boned turkey, pate de foie gras, assorted sandwiches, vanilla and chocolate ice cream, lemon ice, cakes, and Roman punch, a rum-enhanced, meringue-topped fruit punch. Heavenly day! 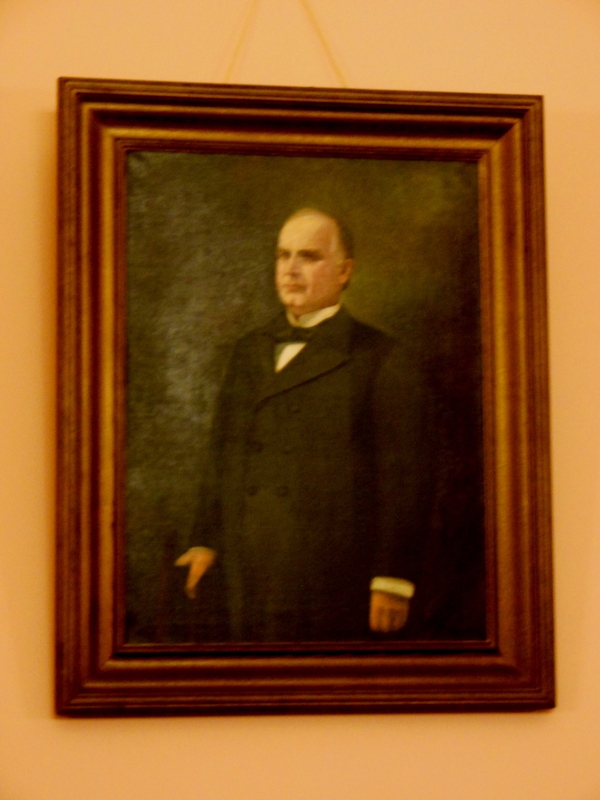 The hearing room also includes a portrait of McKinley painted when he was governor of Ohio from 1892 to 1896. It is attributed to Albert C. Fauley, a teacher at the Columbus Art School who traveled to Europe and painted with well-known local artist Alice Schille. For more on my red carnation-loving hero and his wife, Ida, see my previous posts on the Statehouse statue commemorating McKinley’s ritual devotion to Ida; her dresses and crocheted slippers; and the silver butter knife that the McKinleys gave to the blind lady who brought up my great-grandmother. This entry was posted in Flowers, History, Museums, Ohio, Ohio History Connection (formerly the Ohio Historical Society). Bookmark the permalink. 1 Response to Red Carnation-Loving Ohio Boy, Oh Where Can You Be? An interesting blog, thank you. I remember being told in grade school that upon leaving the Neil House, McKinley would turn and bow to Ida who would be sitting in front of the window. We were also told that McKinley would hand a visitor a red carnation as a way of saying the conversation was over. Albert Fauley and his wife Lucy, also an artist, were born and are buried in Fultonham, Muskingum County. In addition to McKinley, Albert Fauley painted the official portraits of Governors Campbell and Bushnell. The Zanesville Museum of Art and Muskingum County History both have works by the Fauleys in their collections.